Everything in life has a history. Long before the lush home lawns we see today all over the United States, manicured lawns had their place deep in European history. Ever wondered how lawns came to be? Here is a brief history to help you understand the then and now of the lawns we mow. 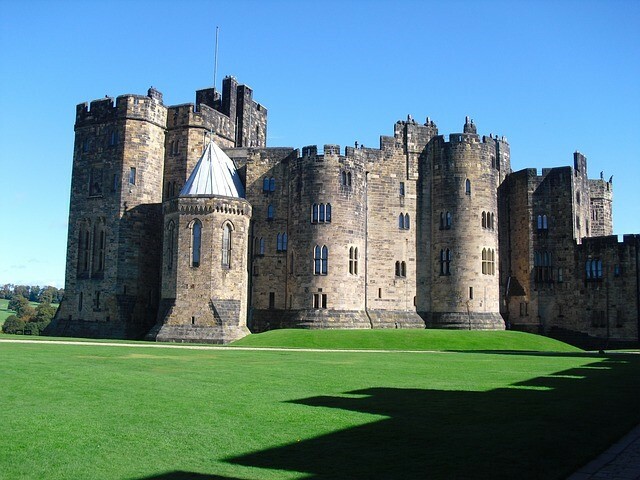 The Alnwick Castle in Alnwick, Northumberland was built in the 11th Century and has been home to many dukes and their families throughout the years. Way back when, around the 16th Century Renaissance, lawns began to be cultivated by the upper echelon of French and English members of society. The first of these carefully procured green spaces were found around medieval castles in France and Britain where unobstructed views were necessary for the soldiers tasked with keeping watch over the royal grounds. These northern sections of Western Europe were perfect breeding grounds for beautiful blades of greenery, as the moist and mild climate of the region historically supports open, close-cut grasslands. As old money rolled through the generations, lawns in France and Britain saw a transition from grazing grounds to meticulously manicured spaces where the wealthy lived. Grass may not have been the most common lawn covering, however. It is likely that chamomile or thyme made up many of the lawns of the 16th Century, both of which are actually still great alternatives to grass ground covering. For the middle- and lower-class, keeping grass and greens at bay was the task of the area's animals. The extensive cost associated with hiring many hands to manually weed and care for the lawns of the wealthy was no challenge for those with money, however. Around the 17th Century, England's largest homes started showing off stunning green spaces, which became a status symbol of wealth, as the cost associated with the hired hands was a known attribute of the beauty. On this side of the pond, just as with many things, we relied upon our European ancestors to bring with them some of the knowledge and tools from the old schools. Grass seeds were carefully transported from Europe by means of protective bundles and bags, ensuring they arrived here with as much possibility for success as possible. Of course, when lawns took off here in the United States, they, too, belonged to the elite class of homeowners. Somewhere in between newly introduced seeds and suburban sprawl, green lawns took on a whole new meaning in the U.S.
As folks flocked to the New World, they brought with them some of their old habits and favorite past times. While England's elites brought with them the seeds and start of it all, the Scots shared their love of certain sports when they arrived. Golf and lawn bowling, both favorite past times of the 16th Century Scots, required close-shorn blades of grass. Scottish commoners had, in fact, been banned from the formerly-beloved game of lawn bowling by the kings for a few centuries. As such, they were happy to bring this royal sport back to the people when they arrived at America's shores. Largely in part to golf's growth, the 1800s saw planning relative to lawns that was unprecedented. This was the century in which today's park was born. Transforming from the European elitist status to the American democratic way, the word 'park' became something for the people, surrounded by serene landscaping, meant to remain well-maintained and serving as a common ground for people to come together to enjoy the beauty of the natural spaces surrounded by grass and greenery. Who knew there is so much history in your backyard lawn? If you are in need of sod in Arizona, contact our team at Evergreen Turf, and let us help you choose the perfect type of sod for your lawn!